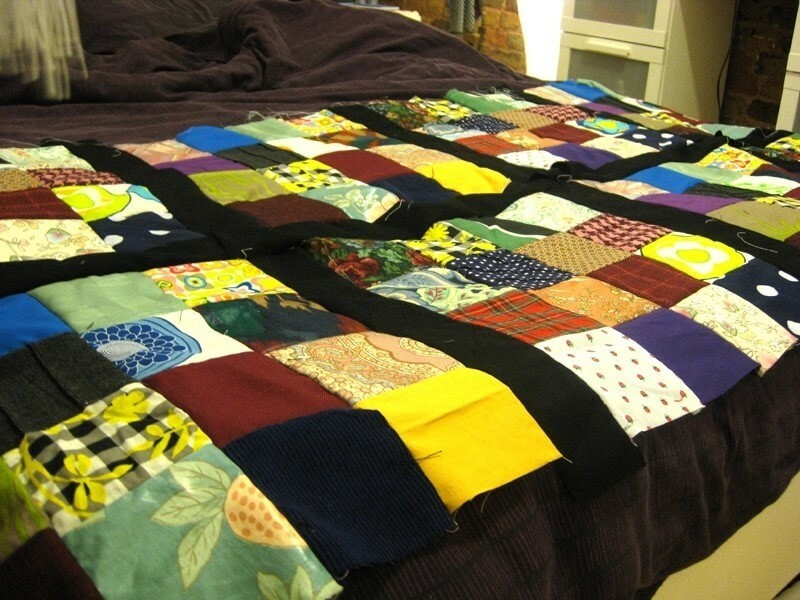 My Mum use to make patchwork quilts and won lots of awards for her designs, so I decided to see if I had it in my genes and made my very own. I'm not the most patient crafter, as I like to jump on to new projects quickly, so even though I had the majority of this quilt finished within two days, I left it for a few months before the cold weather finally forced me to finish it. First I cut my squares, these were 3" x 3". I used around 30 different types of fabric for my quilt and cut 256 squares. 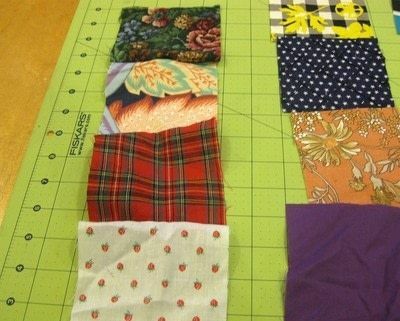 Put them in to neat little piles to make your project easier. 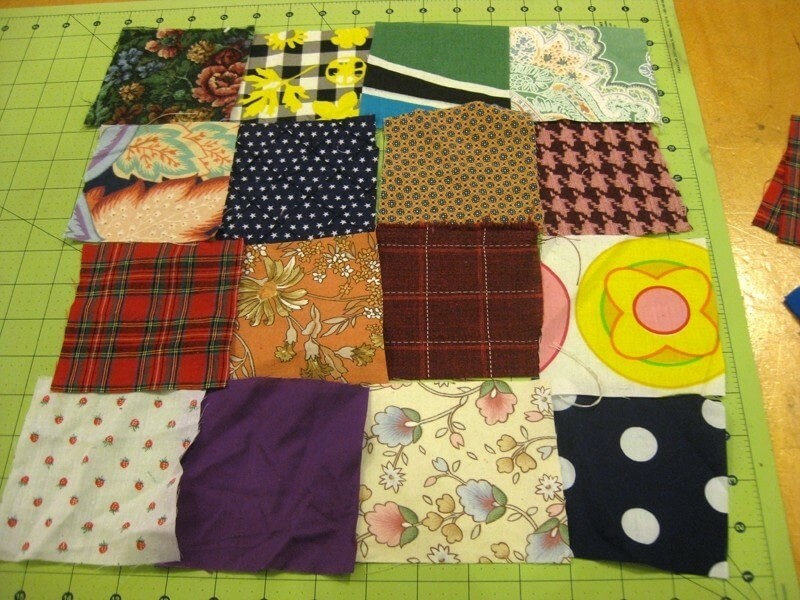 Arrange the squares in a nice way. I did blocks of 16, and I made two different types of blocks. 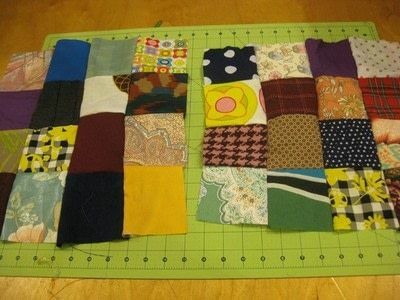 So in total, you should end up with 16 blocks, made up of 16 squares. 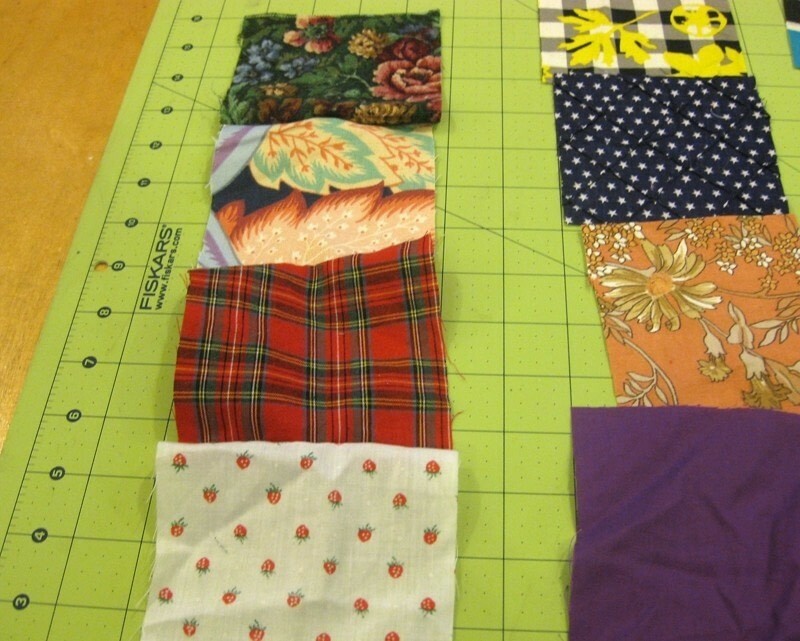 Spread out the vertical rows to give you a bit of space in between each. 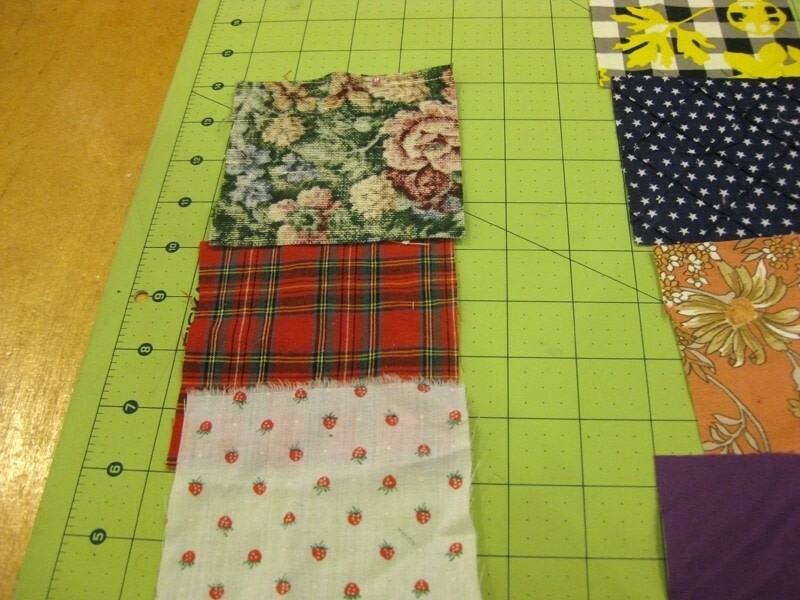 Fold the top square down, so that the wrong side is facing up and place a pin along the top edge, so that you're pinning it to the square behind. 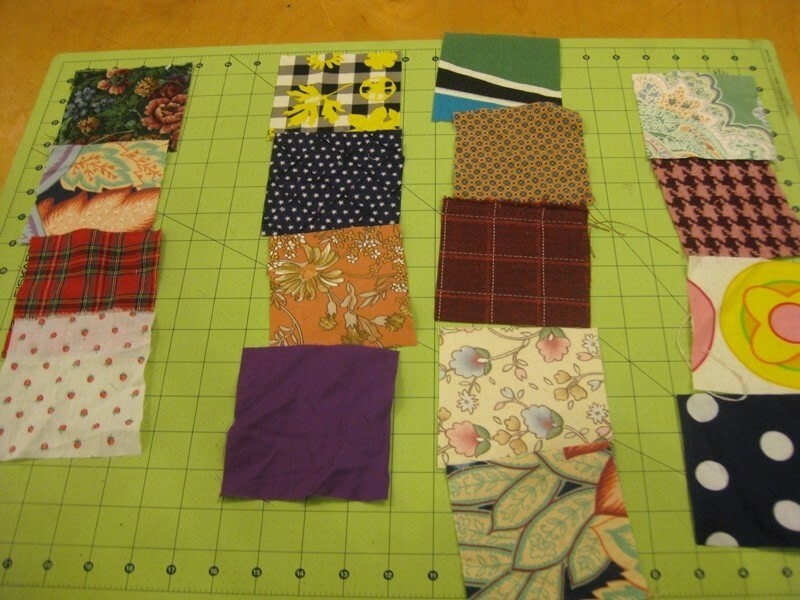 Continue folding down until each square is pinned to the one above. Fold it back up and it should look like this. 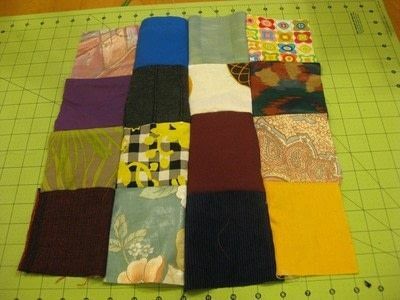 Do the same process for the rest of the vertical strips. Sew along these edges, removing the pins as you go. 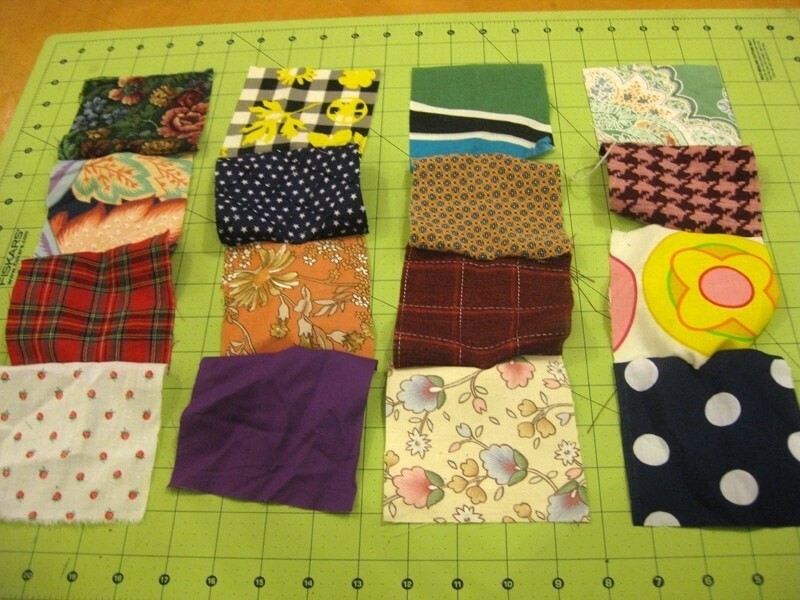 When they're all sewn together they should look like this. Place two of the vertical rows side by side. 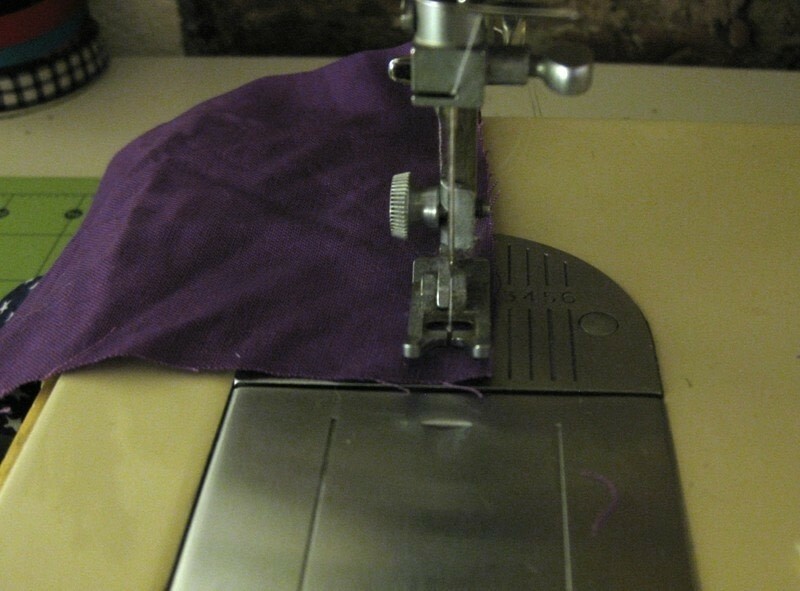 Place one row on top of the other (wrong side facing up) and pin along the top edge. Repeat this for the other rows in the block. 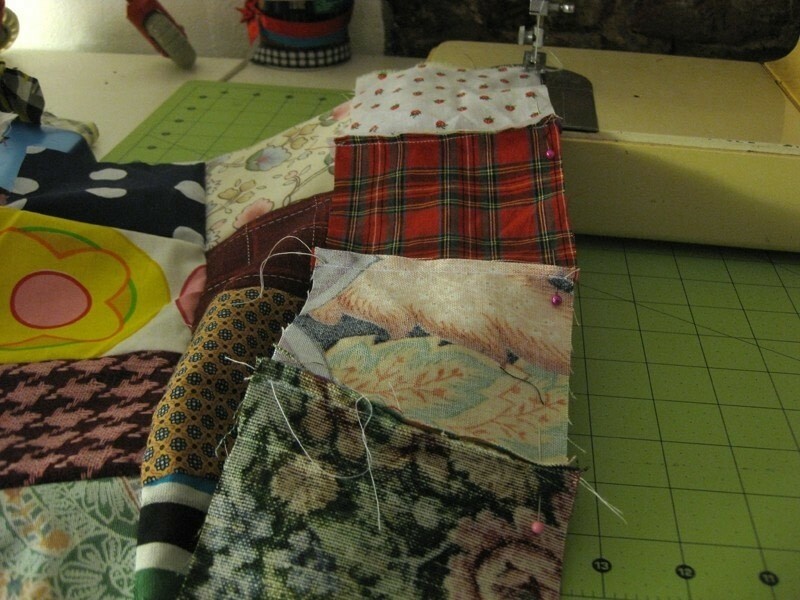 Now sew the rows together, removing the pins as you go. 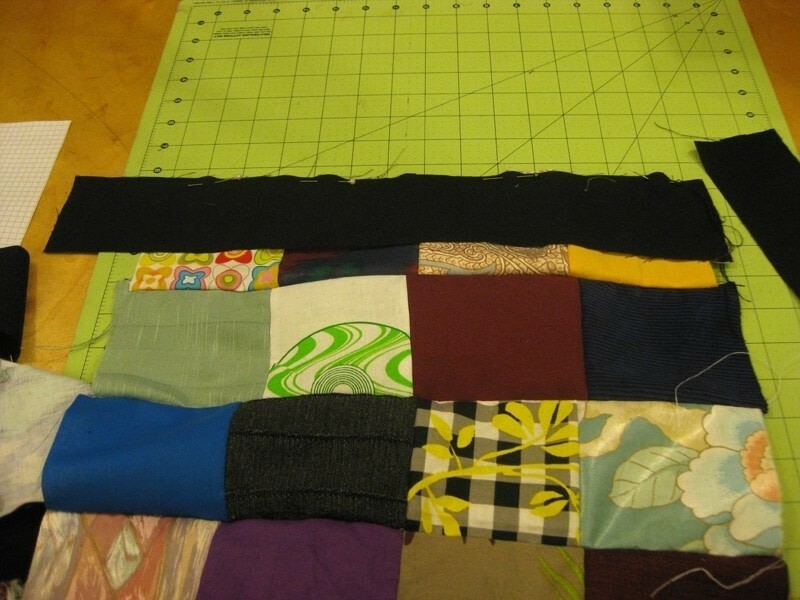 Your finished block should look like this. Here are my two types of blocks. Continue sewing together the remaining squares in to matching blocks. 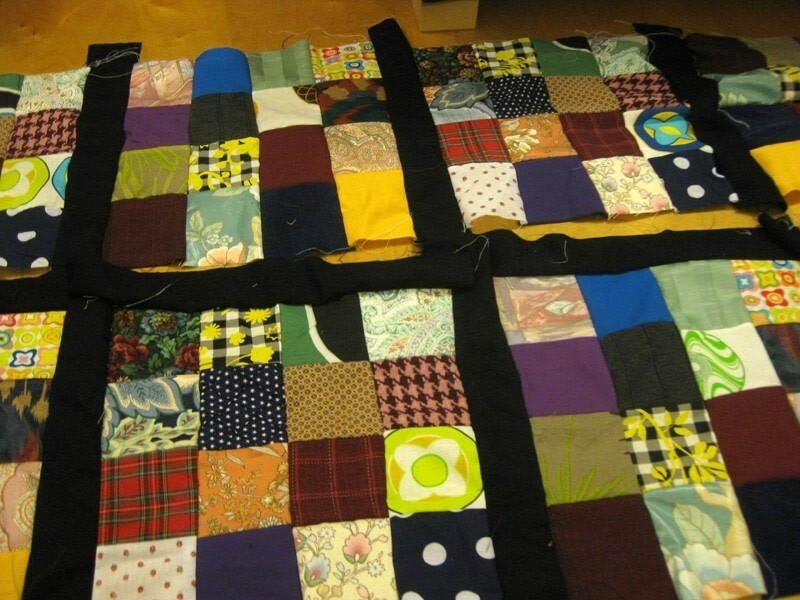 We're going to join the blocks together with black strips of fabric. Cut these out measuring 15" x 3". You will need 24 of these. 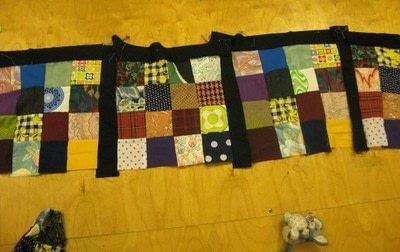 Pin the strip along the top edge of one of the blocks. Sew this in place. 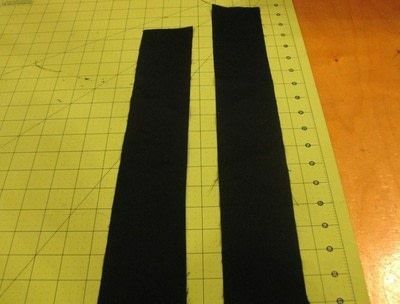 Take one of the contrasting blocks and sew it to the black strip. Repeat this until you have a row of 4. Do this for all of the blocks. I found it easiest to sew four of the black strips together and then pin it to the top edge of the row of four blocks, before sewing in place. Sew another row of blocks on top of the black strip. I put the blocks in an alternative order, so that you would have a different block to the top, left and right of each other. 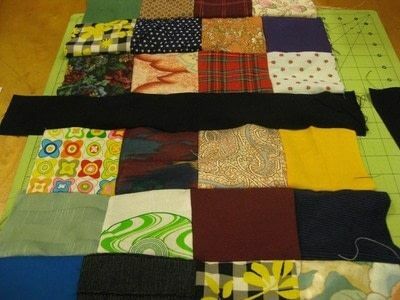 Your patchwork is starting to take shape now. Sew on the other rows and that's the time consuming part of your patchwork finished. Now, it's time to add the batting. The thicker the batting you use, the cosier your quilt will be. 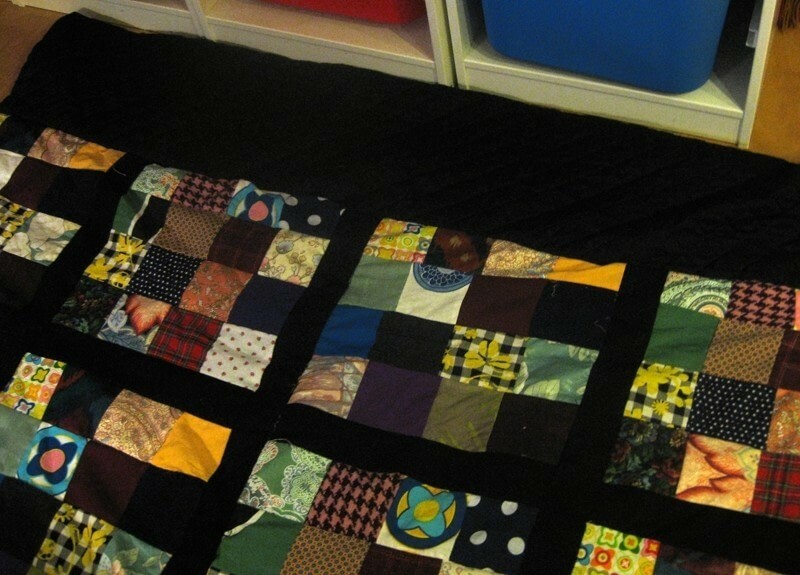 I gave my quilt a 15" overlap of batting at the top edge to make it a bit longer. 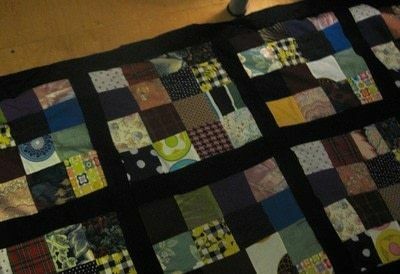 I also gave my quilt a 3" overlap at the bottom. Stitch the batting in place. 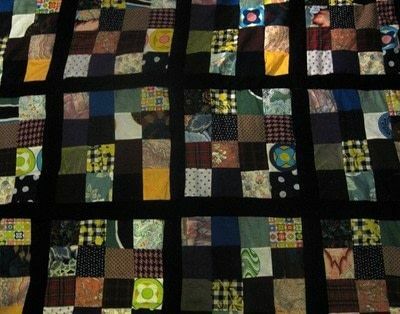 To get the edges all nice, fold the quilt inside out (so that the wrong sides are facing up) and then stitch along the edge, leaving a small area unstitched, so that you can fold it right side out and then sew the opening closed. To give your quilt a nice finish, sew along all the sides of the black strips. 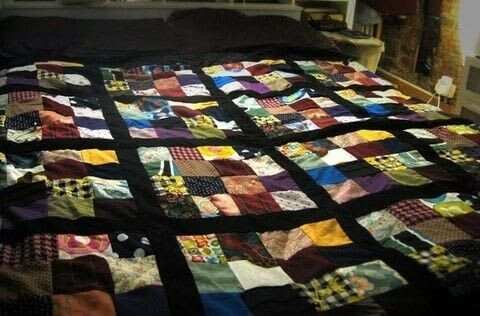 All done, now snuggle under and enjoy! I love your quilt. I'm working on a version right now. 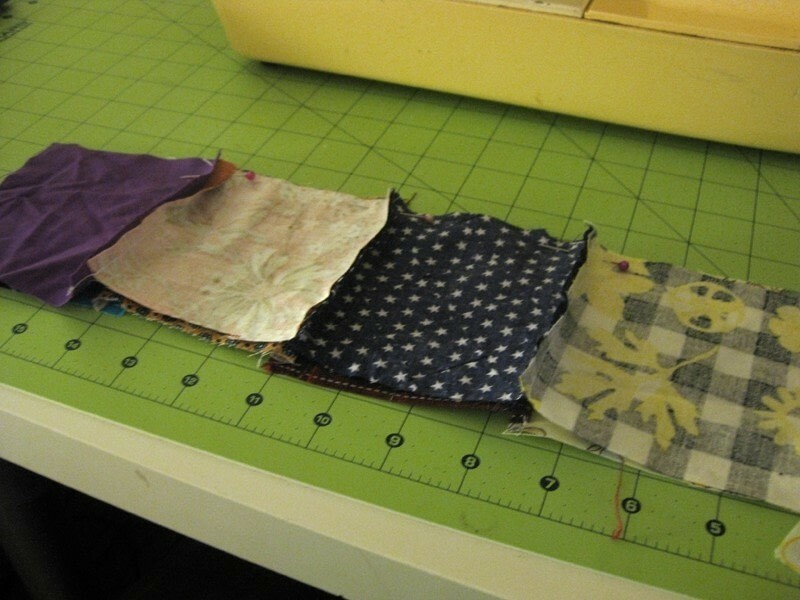 I actually tie dyed each little square. My 3 mo old loves bright colors so i figured it would be a perfect little blankie for him thanks for this wonderful tutorial. Looks very comfortable! I am working on a quilt of my own right now, but it's made in triangles and diamonds. Great tutorial! Absolutely LOVE quilts from a distance, especially memory quilts. 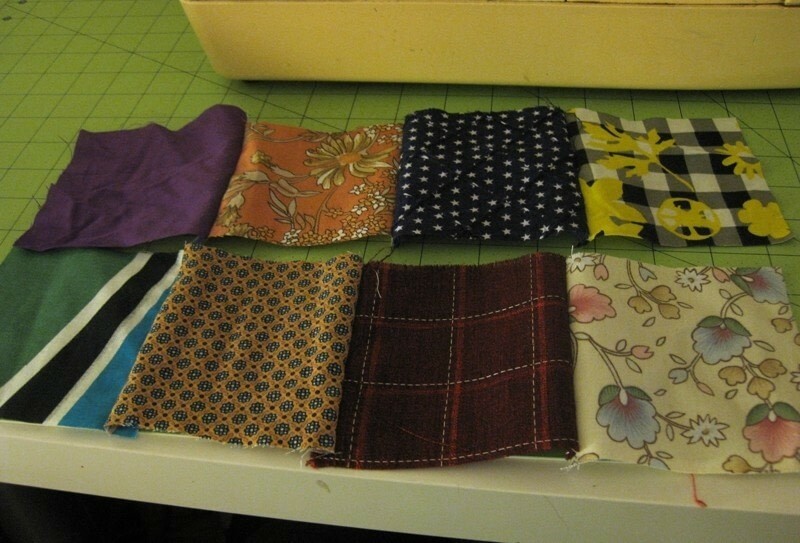 Really like the multitude of prints and patterns chosen too. 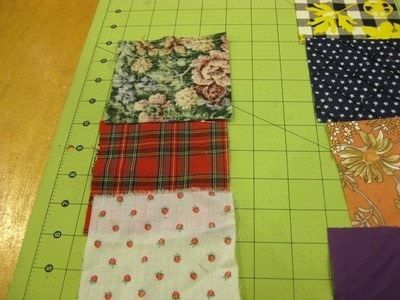 If you are ever looking for a really cool selection of themed novelty cottons, check us out online at www.jofabrics.com. Absolutely beautiful! And what a fantastic tut! 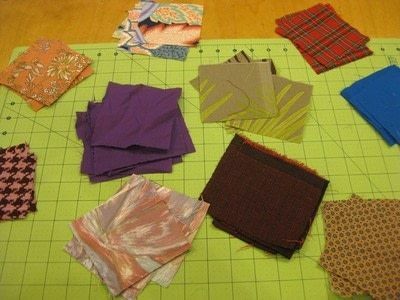 Ty so much, you have really pumped me up on my desire to make a quilt sometime in this lifetime...lol. Now I am far more prepared. I doubt mine will be as beautiful as yours ;-). ive been looking for days for a quilting 'how to' that actually makes sense. Thank god for this tutorial. Thank *YOU* for this tutorial. I was almost at the stage of giving up. I have always been to intimidated to make an actual quilt but your tutorial makes it sound very doable and the quilt looks fabulous - going to give this a try.